Knowing how to budget or invest one’s retirement savings are useful skills. But managing money isn’t just about what you know – it’s also about how you feel. That’s the gist of a handful of recent studies into a newly identified emotion known as financial anxiety. These early studies look at two things: 1) is financial anxiety real? ; and 2) does it explain why people do things like avoiding money issues or going into debt to paper over their financial problems? The evidence says yes to both questions. A 2012 study established financial anxiety as an identifiable psychological condition that can be measured using a standard psychological test. The researchers gauged their subjects’ reaction times to pairs of words flashed on a computer screen – negative financial words (debt), positive financial words (jackpot), neutral financial words (bank), or anodyne control words (camp). The subjects were timed on how long it took to identify a word after an on-screen icon replaced one word in the pair. Americans have been labeled everything from the Greatest Generation to Generations X, Y, and Z. Are you ready for the Centenarian Generation? The number of 100-years-olds has roughly doubled over the past two decades to more than 67,000 – mostly women – and the U.S. Census Bureau predicts it will double again by 2030. Just think about the implication of living for a century: retirement at, say, 65 means 35 years of leisure. This is unappealing to some, unaffordable to many, and it impacts us all. Granted, the Milken panelists – all privileged and accomplished baby boomers – are removed from the financial and other challenges facing most older Americans. But they have thought deeply about longevity and its consequences. Redlining, subprime mortgages sold in minority and immigrant neighborhoods, higher interest rates on car loans – black Americans have reason to distrust the financial system. This spills over into their retirement planning, specifically their relationships with financial planners and how much they save, concludes a study in The Journal of Personal Finance. Among the findings is that blacks and, to a lesser extent, Latinos have difficulty trusting planners. Past research shows trust can play an important role in financial decisions. People who trust the stock market, for example, are more likely to invest in stocks. But black Americans start out with generally lower trust levels: nearly half reported “low trust,” compared with only about one-quarter of whites, according to the survey data used by three finance professors in their study last year. The researchers then assessed whether trust levels affected two specific behaviors: hiring a financial planner and saving for retirement. A lack of trust reduced the likelihood an individual will engage a planner by 18 percentage points, compared to individuals who tend to be more trusting. The surprising result was that blacks were actually more likely to hire a financial planner than were whites with similar incomes when the researchers controlled for trust – meaning the controls eliminated differences in behavior related to individual trust levels. Another finding was that while blacks have less retirement savings than do white Americans of similar incomes, this difference virtually disappears when the analysis controls for the difference in their trust levels. If black Americans could get past their inherent lack of trust and get good advice or good financial products things might be different, said one of the study’s authors, Terrance Martin, an assistant professor of finance at the University of Texas-Pan American in south Texas. Free credit report: Young adults in particular may not be aware they’re entitled to a free credit report from one of the major credit rating agencies. To ensure the report truly is free, click and follow the links to an outside source recommended by the Federal Trade Commission. To file a paper request or ask for a report by telephone, try the federal Consumer Financial Protection Bureau’s website. Replace dog-eared Medicare cards online via your individual Social Security account. If you don’t have an online account, get one here. The share of college students who must borrow to pay for their education has surged over the past decade. Average borrowing per student is also much higher than it was in 2004, though there’s evidence it might now be in decline. Only now is serious research trickling in about the personal financial fallout from the nation’s $1 trillion-plus in student debt outstanding. But one new study reaches an interesting conclusion about the burden of student debt: it “is much greater among non-completers than among those who obtain a college degree.” One reason is that they can’t expect to earn the higher income that a degree confers on a graduate. The study – part of an edited volume published by the W.E. 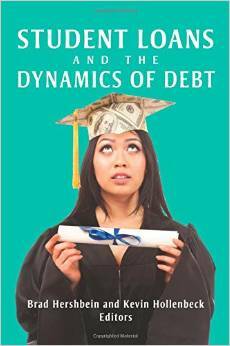 Upjohn Institute for Employment Research, “Student Loans and the Dynamics of Debt” – gauged the debt’s impact on various measures of personal financial stability, including the likelihoods of filing for bankruptcy protection and buying a house.